Hitzlsperger’s outing is not only noteworthy because he is the first male* German professional soccer player to come out as gay and due to the fact he is highly accomplished player at that, winning the German league title as well as appearing in numerous games for the German national side. What makes his outing even more noteworthy is the fact that in his interview with Die Zeit, he did not reduce his coming-out to an individual or personal matter – for instance, framing it as a processes of coming to terms with his identity – but instead tied it to a political project. He argued that it was necessary to make a stand publicly in order to start a conversation about homophobia in soccer and soccer fandom, the pressures of the locker room, and what he called a “mandatory sexuality”, a term very close to what scholars describe as heteronormativity, the societal pressure – and assumption – that everyone be attracted to the opposite gender. Moreover, the timing of Hitzlsperger’s coming-out is no coincidence but comes in the context of a moment of solidarity with the LGBT community amongst athletes and sports fans: The 2014 Winter Olympics kicking off this month in Sochi, Russia, and the host country’s laws against ‘homosexual propaganda’ have led at least some athletes to publicly express solidarity with the LGBT community in Russia and beyond, and has resulted in the media widely discussing this issue. It remains to be seen whether some athletes will even use the Olympics themselves as a stage for political activism. To be sure, Hitzlsperger’s coming-out made major waves in the German public, with many athletes and commentators congratulating him on his decision and expressing the hope that his example will empower queer athletes and youths and will contribute to the eradication of homophobia in sports. Predictably, there were also those ridiculing Hitzlsperger as well as those who managed to only thinly veil their homophobia. Most prominently, former German national team goalkeeper and current color commentator Jens Lehmann stated that he would advice gay players to stay in the closet because of homophobia among fans and players – despite the fact that many current players had actually shown support for Hitzlsperger. Maybe most interestingly, the question of homophobia in soccer – and soccer fandom – in Germany has not only been raised by this high-profile coming-out but by fans themselves over the past couple of years. Although the media and some decision makers in German soccer, such as the head of the soccer association, made the argument that homophobia is an issue primarily amongst fans – not among the league, the clubs and soccer association – and that top-down strategies to combat homophobia are the only solution to this problem, the reality is actually much more complex. 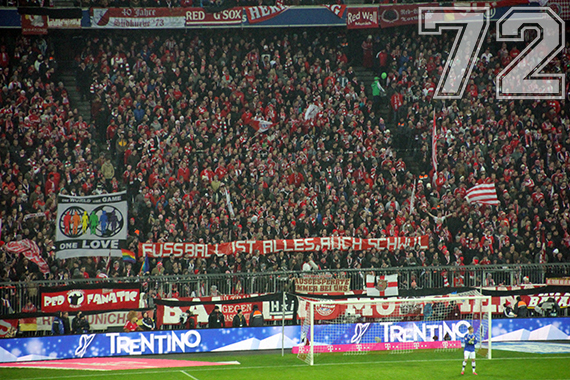 To be sure, homophobic rhetoric has been and remains widespread in German soccer stadium – and I am sure every progressive soccer fan knows the feeling of disgust when hearing someone make comments about “that gay tackling” by a player on the pitch – but at the same time, grassroots fans have taken on these issues in the past years. In addition to openly LG(BT?) fan clubs that now exist in many cities, it has often been members of ‘Ultra‘ fan groups – passionate supporters of their soccer clubs who often also engage in political activism around soccer, and taking on characterisitics of what might be called ‘fan unions’ – that have made statements against homophobia and that have tried to address sexism, homophobia and racism amongst soccer fans; even at times when the soccer association had rather preferred to sweep such problems under the rug. Fans in different stadiums have shown banners against homophobia in the stands, have organized large-scale ‘choreographies’ in the stadium, have written flyers or have made anti-homophobia, anti-sexism and anti-racism core principles of their groups. Although clearly not representing the majority of soccer fans, these initiatives do indicate a politicization among fans and an increased awareness for LGBT issues as well as sexism and racism. Thus, it remains to be seen whether such grassroot movements in concert with advocacy by former and active players can radically transform the gender politics of such typically hypermasculine fields as soccer and soccer fandom. * It is important to note that paralleling the situation in the US, it has long been an open secret and/ or taken for granted that a number of female athletes are openly gay. That, of course, is not to say that there has been less homophobia in women’s sports. Rather, it seems to work differently: Whereas in men’s athletics, the assumption seems to be that homosexuality contradicts athletic ability – thereby rendering gay male athletes invisible and making sports a potentially hostile field – women’s athletics have been culturally associated with homosexuality, putting pressure on women athletes to perform femininity and heterosexuality in order to escape this stigma. Eric Anderson. 2005. In The Game: Gay Athletes And The Cult Of Masculinity. Jamonn Campbell et al. 2011. Sport Fans’ Impressions of Gay Male Athletes. Journal of Homosexuality 58(1): p597-607. Elizabeth S. Cavalier. 2011. Men at Sport: Gay Men’s Experiences in the Sport Workplace. Journal of Homosexuality 58(5): p626-646. Judy Davidson. 2013. Sporting Homonationalisms: Sexual Exceptionalism, Queer Privilege, and the 21st Century International Lesbian and Gay Sport Movement. Sociology of Sport Journal 30(1), p57-82. Helen Jefferson Lenskyj. 2012. Gender Politics and the Olympic Industry. Helen Jefferson Lenskyj. 2014. Sexual Diversity and the Sochi 2014 Olympics: No More Rainbows.